What would you ask Kim Stanley Robinson? This is not a rhetorical question, by the way. The nice people at Harper Collins are soon to be launching their new VoyagerBooks.co.uk website and getting to grips with the intermawebz, and as part of the preliminaries they’re throwing six of their biggest genre fiction authors on the mercies of six different genre fiction blogs, including Big Dumb Object, SFF Chronicles, SFF World, Speculative Horizons and Book Geeks. The good Mr Robinson has been chosen to appear here at Futurismic, and you lot get to pick the questions. I dare say it’s a pretty good match; Robinson’s interests – science, politics, climate change and space – are very much in line with the stuff we talk about here from day to day, and I’m sure he’ll be amenable to questions about his writing in more general terms (provided you don’t ask him where he gets his ideas from). 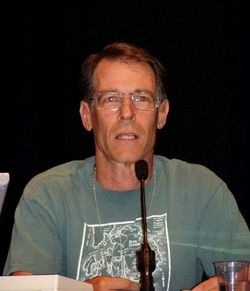 So, here’s the way we’re gonna do it: if you’ve got a question you’d like to put to Kim Stanley Robinson, leave a comment below. Simple enough? There are some basic rules, though – honest and non-snarky questions only (I’ll just ignore or delete anything silly or rude, I’m afraid, but controversial science and politics are fine), keep them to a reasonable scale (something that can be answered in a few paragraphs or so), and the deadline will be 1800 hours GMT this Wednesday, 8th April 2009. If there are too many, I’ll pick out the best. Can humanity solve it’s most pressing problems (overpopulation, pollution, environmental degradation, resources depeletion, climate change and more) and get into space, as well? Or is it a matter of either, or? Which of the alternative worlds in your Orange County trilogy do you we are closet to right now, or likely to reach first? When Humanity eventually leaves Earth to colonize the surrounding Planets and Moons in our Solar System what kind of government or governing body could we potentially see? One all powerful singular government body, a conglomerate of host nations, colonies exerting their own independence or something entirely new? First question: given the level of detail you put into the terraforming of Mars in the Red/Green/Blue trilogy, and then into impending man-made crises first in Antarctica and then in the ‘Capitol’ books, have you ever considered writing a non-fiction book on the subject of global warming and related matters? Second question – given the recent reflection in the sf community on the viability of humanity having any sort of real chance of making significant steps towards the exploration and possible colonisation of the solar system (as evidenced in the ‘mundane’ movement), what are your own feelings on the subject? Do you think there’s a realistic chance it could happen in a serious way, or that it’s genuinely necessary for the survival of the species? Or do you agree with the argument that colonising the moon or Mars and beyond is an unattainable fantasy unlikely to take place anytime soon, if ever? Chunky or Smooth peanut butter? Also : are Peanut butter Kitkat Chunkys the nectar of the Gods? Does KSR consider himself an environmentalist author? While the Science in the Capital Series and Antarctica suggest a deep concern for such matters, the Mars trilogy sees a new society emerging out of intentional ecological destruction and The Years of Rice and Salt have a very similar focus. So my question would be whether KSR’s writing are motivated primarily by concern over the environment or whether he sees ecological change as a catalyst for social change? Does he blog? Has he ever considered it? Also, what does he think about genetic engineering’s role in moving toward sustainability? I’m thinking in particular of the book Tomorrow’s Table, by UC Davis researchers Pamela Roland and Rauol Adamchuk, which argues for combining organic agriculture with GM crops. Thanks for the input, folks – I’ve got to get these sent off to KJR now, so I’m gonna close up the comments field. Thanks for taking part, and look out for the replies real soon!